hi i have asrock ab350 itx but vrm temperature showing 107c in aida64 engineer so it is really 107c ? or just bug? I don't think that reading is valid, but it's hard to tell. 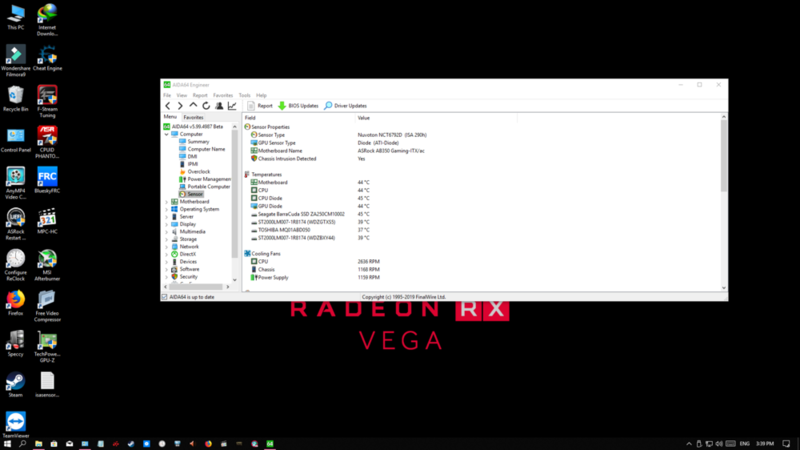 Can you please check whether you can see the same VRM thermal reading in the UEFI Setup (BIOS Setup), or in ASRock's own monitoring utility called F-Stream Tuning utility? First, please right-click on the bottom status bar of AIDA64 main window --> Sensor Debug --> ISA Sensor Dump. Copy-paste the full results into this topic, or attach the results as a TXT file to your post. You may need to enable status bar in AIDA64 / main menu / View first. DMI SYS Manufacturer: To Be Filled By O.E.M. DMI SYS Product : To Be Filled By O.E.M. DMI SYS Version : To Be Filled By O.E.M. DMI SYS Serial : To Be Filled By O.E.M. In the utility and BIOS Setup can you see more than one temperature for your motherboard? Is it indicated specifically as VRM temperature? Thank you for the dump. The VRM temperature register indicates 107 Celsius there as well, so I assume the reading needs to be removed. in the utility "asrock f stream" only show motherboard temp are under 45c and in bios only show reading same like f stream utility so there are no VRM temperature reading on asrock f stream and Bios setup only motherboard temperature and processor reading are present. Thank you for the info. We'll remove the VRM temperature reading in the next AIDA64 beta update. Hi the problem has been solved in the latest beta update thanks !